The Cook County state's attorney has asked the county's inspector general to review how her office handled the 'Empire' actor's criminal case. CHICAGO — The Cook County state’s attorney said Friday that she has asked the county’s inspector general to review how her office handled “Empire” actor Jussie Smollett’s criminal case. 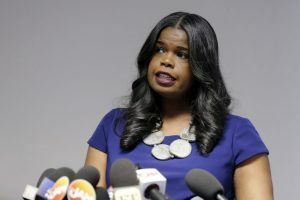 Chicago Mayor Rahm Emanuel and others have criticized the decision by Kim Foxx’s office to drop charges against Smollett accusing him of filing a false report to police that he was the victim of a racist, anti-gay attack in January. A grand jury indicted the actor on 16 counts in early March. Foxx’s office dropped the charges about three weeks later, giving no detailed explanation for why the case was abandoned. Smollett has maintained his innocence and insisted he was attacked. The Chicago Tribune first reported Foxx’s request Friday and reported Cook County Independent Inspector General Patrick Blanchard sent a letter to Cook County Board President Toni Preckwinkle and other county leaders informing them of Foxx’s request. Blanchard wrote that Foxx asked for a review “of the circumstances surrounding the resolution of criminal charges formerly pending against Jussie Smollett.” He wrote that his office would proceed with the review. The city of Chicago filed a lawsuit Thursday in Cook County court against Smollett, who is black and gay, in a bid to recoup the costs of investigating his claim that masked men beat him Jan. 29 in Chicago, shouted slurs and wrapped a rope around his neck.